With the Appeal Court issuing an interim order not to file charges under the Public Property Act for his role in the alleged misappropriation of Government funds worth over Rs. 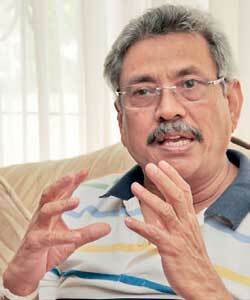 60 million rupees to build a monument for his parents, former Defence Secretary Gotabhaya Rajapaksa has contested the authenticity of his signature on official documents and claimed that a ‘verbal contract’ existed in connection with his family foundation and the Government, the Dailymirror learns. According to submissions made to the Colombo Fort Magistrate Court (B/30485/ 4/ 15) by the Financial Crimes Investigation Division (FCID), one institution coming under the purview of former Defence Secretary Rajapaksa bore the cost to construct his father’s monument and memorial museum. Rajapaksa, who contests the allegations, is suspected of having used his official position to cause the misappropriation of state funds for this purpose, a non-bailable charge under the Offences against Public Property Act. According to the former Defence Secretary, he had verbally agreed with the Sri Lanka Land Reclamation and Development Corporation (SLLRDC) to get the D.A. Rajapaksa monument and memorial museum constructed at Weeraketiya, agreeing in the process to pay the money back through his family foundation. However, several higher officials in their statements to the FCID had stated that there was no agreement, either written or verbal, between the Corporation and any party for this project, and that hey had acted solely on the Defence Secretary’s instructions. The ‘B’ reports submitted to courts summarize the statements by the higher officials at SLLRDC including Chairman Prasad Harshan de Silva (Who held office during the Rajapaksa era), members of the Board of Directors and the General Manager. According to their statements, the SLLRDC had planned to appoint a committee to organize several musical shows to generate funds with the aim of recovering the money spent on building the D.A. Rajapaksa monument and memorial museum (Weeraketiya Project). However, so far, no official records have been produced to corroborate this claim. Meanwhile in an audit query on the Weeraketiya Project, questions have been raised as to on whose advise the Navy was directed to provide the manpower for construction work. By letter dated September 3, 2013 Chairman SLLRDC had informed the Navy Commander to carry out the construction work. The letter, written for this purpose, states ‘further to the meeting held at the Ministry of Defence and Urban Development on August 29, 2013, we have been advised to request the SL Navy to carry out the construction of the D.A. Rajapaksa Memorial at Medamulana. ‘Therefore please make arrangements to commence this work early as it has to be completed by early November 2014 for the opening on November 10, 2014. The architectural drawings and structural drawings of the memorial done by us are ready with us to commence the work. Chairman SLLRDC’. By letter dated February 12, 2014, DGM (Drainage and Reclamation) S.P. Muthumala to the Chairman and General Manager had requested to release Rs.10 million to the Sri Lanka Navy to commence the work until the approval of the Board of Directors is obtained. The letter further states, ‘On the directives given by the Ministry of Defence and Urban Development, the Corporation was involved in the preparation of drawings and BOQ for the above work. The BOQ was submitted by the R & D division which amounts to Rs.33.944 million a copy of which is annexed. ‘The Sri Lanka Navy has sent us a letter No: DGCE/ DIR/ SOUTH/ 11/ 2013 dated January 27, 2014 requesting us to release an advance payment of Rs.10 million to procure the required materials to commence and mobilize the above site. Therefore your approval is hereby sought to release Rs.10 million to Sri Lanka Navy to commence the work at site until the approval of the Board of Directors is obtained’. Knowing that this procedure was against SLLRDC rules and regulations, General Manager Srimathi Mallika Kumari Senadheera who is alleged to have given instructions to carry out the project is said to have instructed the DGM (Finance) to release the money. However, in her statement to the FCID Senadheera had stated that she had to instruct her officers to make payments to the above project on the directives of the Chairman and that she had to give such instructions in fear of losing her job in the event she opposed to release money. According to her statement, SLLRDC undertakes private constructions, but during such an event, at the time of signing the contract, 20% of the estimated cost was obtained and money was taken after producing the bills. As this was not a private construction, the Corporation did not enter into an agreement with Rajapaksa nor charged 20% of the estimated cost and states that only after the FCID started the investigation, that Rs.25 million had been remitted to the SLLRDC account from the D.A. Rajapaksa Foundation. Development Officer Weeraketiya Pradeshiya Sabha, Anthonige Gunathilaka in his statement had said that approval hadn’t been obtained from them for the Weeraketiya Project, hence it is an illegal construction. asked whether the ‘client’ at any stage, after the construction was completed, handed over a request to the SLLRDC to send the bills for the construction, Senadheera said that a request letter was sent only after the FCID investigations were initiated. However she declined to furnish further details and wanted this newspaper to contact the Chairman for further information. All attempts to contact the Chairman failed as he was not in office. In the meantime, a higher officer at the Auditor General’s Department, who was granted anonymity to discuss official matters, said that although an audit query had been forwarded to SLLRDC Chairman on March 24, 2015, calling for information for clarification, the SLLRDC hadn’t been able to submit proper clarifications regarding the queries. According to the audit query, the expenditure regarding this project as at December 31, 2014 was Rs.61.71 million. According to the land reclamation division, the cost was Rs.62.116 million. The query further states, ‘Without the board approval, SLLRDC Chairman had paid an advance of Rs.10 million to the Sri Lanka Navy. The Navy meanwhile had procured more raw materials regarding construction to the value of Rs.14.664 million as of March 25, 2014 and had further requested another Rs.15 million. The SLLRDC had released the said money on May 8, 2014. However, the SLLRDC had failed to obtain the expenditure reports from the Navy and had requested to obtain details on whose instruction the project work had been handed procurement guidelines had not been followed’. 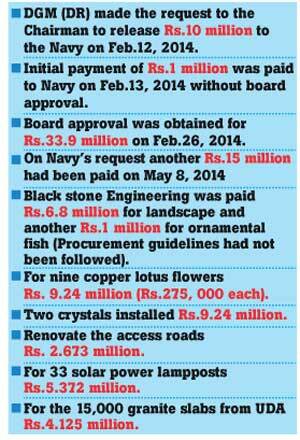 The audit query further reveals as to how the Corporation had offered a contract to Black Stone Engineering without following procurement guidelines and paid Rs.6.8 million for the landscape and another Rs.1 million to buy ornamental fishes to the pond therein. Also, it reveals how SLLRDC had purchased nine copper lotus flowers which had cost Rs.275, 000 each while two crystals had been installed at a cost of Rs.9.24 million. Renovating the access roads had been done at a cost of Rs. 2.673 million. Another Rs.5.372 million had been paid for 33 solar power lamp posts and for four flash lights. The SLLRDC had not given authority to the Urban Development Authority (UDA) for the 15,000 granite slabs that had been obtained at a cost of Rs.4.125 million. The audit query further states how the SLLRDC had obtained a loan from the National Savings Bank to the tune of Rs.14, 277 million to carry out all its projects to which the Corporation has to pay back Rs.592.791 million during each of the 24 installments. Meanwhile the owner of AS Creations, Aruna speaking to the Daily Mirror said how Black Stone Engineering offered a sub contract to his company for the landscape, but the final payment had been withheld by the SLLRDC. “My estimated cost was Rs.3.9 million and I was paid an advance of Rs.1 million. I gave them a discount of Rs.400, 000 and the remaining Rs.2.5 million is yet to be reimbursed,” Aruna said. Meanwhile, Rohan Praminda Seneviratne, a former Director SLLRDC, in his statement had stated that he was an Additional Secretary (Technical) at the Defence Ministry and it was he who forwarded the board decision for the Defence Secretary’s approval as per the letter dated December 9, 2013 Ref: No: MOD/ SEC/PA/ 01(115) sent by former Defence Secretary’s Coordinating Secretary Maj. Gen. H.L. Weeratunge instructing all institutions coming under the Defence Secretary’s purview to obtain the Defence Secretary’s signature before implementing the board decisions. He had further stated that it was he who had prepared the covering letter and received the approval from the Defence Secretary for the above project. Former Director Sirinimal Perera during his statement had stated that the board approval to release funds had been granted on the former Chairman’s directives, which didn’t come under the SLLRDC’s purview. Indira de Silva (Deputy General Manager-Finance SLLRDC) had stated that on the directives of the General Manager, Rs.10 million was paid as an advance to Sri Lanka Navy on February 13, 2014 without obtaining a board approval and another Rs.15 million on May 8, 2014 after obtaining the board approval on February 26, 2014 for Rs.33.9 million. According to her, Rs.3.2624 million had been paid to Black Stone Engineering without following procurement guidelines, but on the instructions of the then Chairman. Assistant Director National Budget Department Harshani Maduka Ranasinghe states that she is in charge of releasing funds to SLLRDC, but as per the letter dated July 16, 2013, the SLRDC requested only Rs.6767.05 million for four projects for 2014, but never asked for any allocation for the Weeraketiya project. Dananjaya Dharmaratne (DGM (Supply) SLLRDC) states that he had to release goods worth of Rs.16 million for this project and Rs.3.262 million was paid to Black Stone on the instructions of the Chairman and the General Manager violating Government procurement guidelines and that all purchases had been made on the written requests made by Project Coordinator Deputy General Manager (Drainage and Reclamation) S.P. Muthumala. Coordinating Secretary to the former Defence Secretary, Harsha Lakshman Weeratunge, in his statement confirms that the Defence Secretary granted approval to the Board’s decision to release money for the questionable construction. Meanwhile MP Chamal Jayantha Rajapaksa in his statement states that he knew nothing about the SLLRDC’s and Navy’s involvement in the construction, but added that only the land was given to construct the museum and the monument in respect of what D.A. Rajapaksa had done for the people of Giruapattuwa. However, Nandasena Gotabhaya Rajapaksa had stated that it was on his recommendation, that Harshan de Silva was appointed as the Chairman SLLRDC and that on his request, the structural drawing was shown to Mahinda and Chamal Rajapaksa and it was afterward that this construction work had been started. He further states that he knew about the SLLRDC’s Board decisions regarding the project, but had never given his approval to the decision. He further states that it was the responsibility of the SLLRDC officials to enter into an agreement with the Foundation and to obtain the advance payment of 20% of the estimated cost. According to him at the time he was giving his statement to the FCID he had already paid Rs.25 million to the SLLRDC and the balance would be settled by the D.A. Rajapaksa Foundation. Development Officer Weeraketiya Pradeshiya Sabha, Anthonige Gunathilaka in his statement had said that approval hadn’t been obtained from them for the Weeraketiya Project, hence it is an illegal construction. Deputy Chairman D.A.Rajapaksa Foundation Upul Ranjith Samarasinghe says that the Foundation did not have any discussions with the SLLRDC regarding the construction nor had they make a written request to the SLLRDC nor did they enter into an agreement. When a text message was sent to Gotabhaya Rajapaksa seeking a comment, he replied stating that this newspaper should contact the former Chairman SLLRDC to obtain a comment. “I am out of the country. Please contact Harshan de Silva former Chairman SLLRDC. He can give a comment,” Rajapaksa said in his text message. Although Harshan de Silva was contacted thereafter, he wanted this newspaper to call him the following day to make an appointment with him for a reporter to meet him. However, as requested, when calling De Silva the following day, he did not answer any of the calls nor respond to the text message sent to him. Present Chairman SLLRDC Asela Iddawala when contacted said that there wasn’t any board resolution to recover the money from the Rajapaksa Foundation, but they wished to recover the money from well-wishers. “Although the initial estimate, stated in the board minutes, was Rs.33.9 million, it rose to Rs.64.808 million later because on many occasions, the constructions at the project site had to be demolished on the request of the members of the foundation. This was done whenever they wanted to give a face lift to the site. This cost nearly doubled in comparison to the estimated cost. We have all the records of the demolitions and the bills to prove the new purchases. With the presence of Government taxes, this went up to Rs.81.313 million and it is unfair for them to claim that they are liable to pay only the initial estimated price,” Iddawala said. Iddawala further said that he had no other option, but to send a letter of demand to the Rajapaksa Foundation requesting it to pay the money back following the audit query he had received from the Auditor General’s Department.